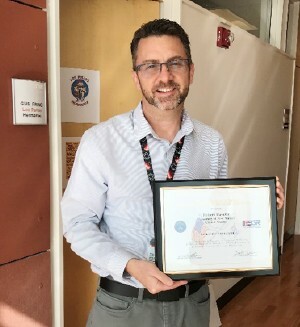 Robert Payette, Clinic Nurse Manager, and Sandi Peacock, Clinical Operations Director, have been recognized with the Patriot Award from the Department of Defense, NM Committee for Employer Support of the Guard & Reserve. This award was given for contributing to "National Security and Protecting Liberty and Freedom by Supporting Employee Participation in America's National Guard and Reserve Forces." UNM CCC employee, SSG Albert Bales is a member of Delta Company 4th Reconnaissance Battalion, United States Marine Core Reserve and submitted the nomination. “My employer hired me in August 2017, shortly after, I was told I was deploying in September. I have only been employed by the Cancer Center for a month. My employers went above and beyond to make sure I was taken care of prior to my early departure from the canter center. I can’t thank them enough for the support of my coworkers and supervisors during this stressful process. Their reassurance was welcoming and their support was greatly appreciated. I look forward to continuing my employment with them when I return in a year.” – SSG Albert Bales. Read more about the award.